One Nashville restaurant owner has been warning other owners to be vigilant of their surroundings after thieves caused more than $20,000 of damage to her business. Jennifer Carpenter, owner of The Garden Brunch Cafe, said she noticed a problem with the AC units when she visited the restaurant located on Jefferson Street on Thursday. "It really kind of took us back. We had a brand new unit that’s not even a year old that was completely destroyed, and they destroyed our second unit, as well," Carpenter said. According to a police report, thieves stole copper sometime Wednesday night. Carpenter had to close the restaurant on Friday for new units to be installed. The restaurant is only open Fridays through Sundays from 9 a.m. to 2 p.m.
"It hurt more than anything for my employees because if they don’t work, they don’t eat. I have 20 employees," Carpenter said. Carpenter added she'll bounce back and isn't letting the theft bring her down. She and her husband, Karl, have run the popular restaurant for nearly ten years. "The first couple of years we had several break-ins, 15 to be exact. Jefferson Street in particular is a great place to be. The businesses that are here making an effort to be here, we would just like people to watch and do more, making sure that people are not trying to intentionally get them closed down," she said. 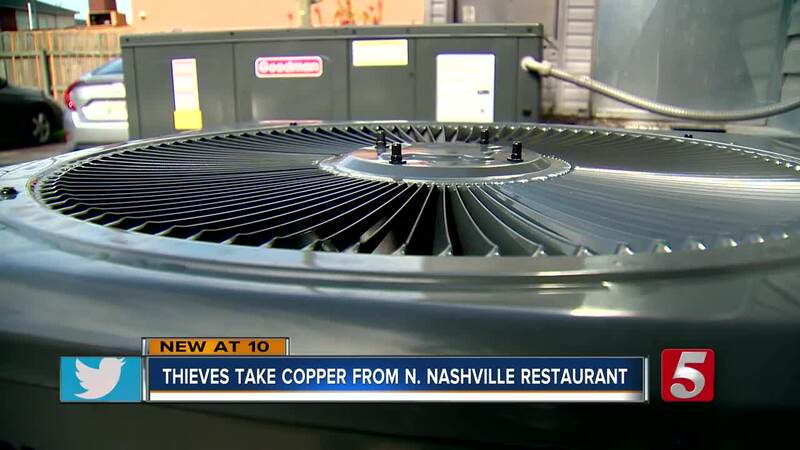 Officials with the Metro Nashville Police Department said copper and air conditioning unit thefts are on the rise in North Nashville due to the construction of new buildings. Anyone with information on this latest theft has been asked to call Crime Stoppers at 615-742-7463.